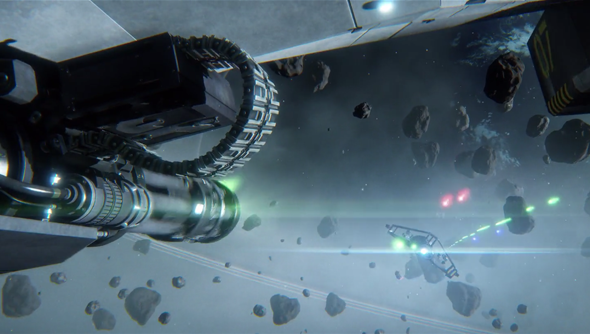 “We scale everything for the super high resolutions that will be the basis of tomorrow’s gaming experience; our assets are designed with high polycounts instead of having details baked into their textures,” write Roberts Space Industries in the blurb to their new trailer. It sounds like a lot of marketing speak but they claim the video is “rendered 100% in-engine in real time at 4k resolution.” If that’s true and the graphics cards of the next few years can play a game looking this good then we’re in for a treat. As well as the commercial for the Hornet, RSI detailed three variants of the craft that players can invest in. A little like Battlestar Galactica’s Blackbird, the Ghost is built to be undetected by radar. You can sneak right up on your enemy before firing off the first salvo into their fuselage. If you’re looking for a ship that’s both maneuverable and fitted out with scanners then the Tracker is the way to go. It’s built for battlefield awareness and its sensor suite lets you keep your wing updated on the space around them. Just look at it. This thing’s clearly been built with the school bully in mind. It’s bigger, better armoured, and packed with firepower. It even has a second seat for a radar operator. RSI have released a brochure detailing the Hornet’s specifications.